Facebook – My Identity Arbiter? a person who has the sole or absolute power of judging or determining. When I read the recent Computerworld article, “Facebook: The new arbiter of enterprise identity” this morning. I didn’t quite know what Arbiter meant, so I looked it up. Today Facebook knows your identity. Tomorrow Facebook may very well be your identity. Before long, enterprise identity and access management may key off of social media identities rather than remaining an island unto itself. Are you prepared? That’s the message that Gartner analyst Earl Perkins passed on to attendees at the Gartner Symposium/ITxpo conference last month. I know I’m not ready, and highly doubt my employer is ready to cede “absolute power of judging or determining” to Facebook or any other independent entity. We have a long way to go before any corporation in its right mind would trust Facebook or any other popular social media site to authoritatively vouch for the identities of their employees. 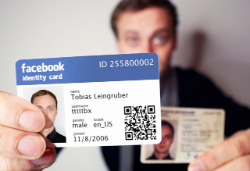 … until there is some sort of formalized identity verification done around Facebook it will be difficult for an enterprise to simply accept a Facebook credential. Is that Facebook user really me? Also, what about stronger password policies (length of password, change period, complexity, use of strong two-factor authentication) and better security generally for Facebook? There needs to be more enterprise security built into Facebook before it can ever be used by an enterprise. So, let’s wait and see. I think it will be a long time before Facebook or any other identity provider supplants the core identity management infrastructure of major enterprises. Complement, certainly. Replace? It will take a while.